Last corner shenanigans between Ducati’s Andrea Dovizioso, left, and Repsol Honda’s Marc Marquez. Races feature a screaming symphony of prototype motorcycles accelerating to speeds of up to 220 mph, followed by stoppie-inducing braking maneuvers to slow the bikes down enough to get them into seemingly impossible lean angles with riders’ knees and elbows dragging around the corners. Then repeat. The sport’s biggest star remains Valentino Rossi, the seven-time champion of the premier class that he has been racing in since 2000. The mercurial Italian turned 39 last month, but made it known that he wanted to keep racing for two more years after his contract expires at the end of the season. Given his massive popularity around the world, it was hard to imagine that Movistar Yamaha wouldn’t want to hold on to him, but “The Doctor” didn’t officially sign the contract extension until Thursday. “I came to the conclusion that I want to continue because racing, being a MotoGP rider, but especially riding my M1, is the thing that makes me feel good,” said Rossi. The 2018 season gets underway under the lights in Qatar on Sunday, with the U.S. stop in Texas coming on the series’ third race weekend on April 22. Honda, Ducati, Yamaha and Suzuki are the big factory efforts here, though some of the customer teams are capable of outshining the big boys—especially when the weather gets iffy (yes, they race in the rain). KTM is also making big strides in its nascent factory team effort in the top class, and Aprilia is hoping this will be a breakthrough year. Recent seasons have had more than their share of excitement with multiple race winners and hard-fought championship battles. 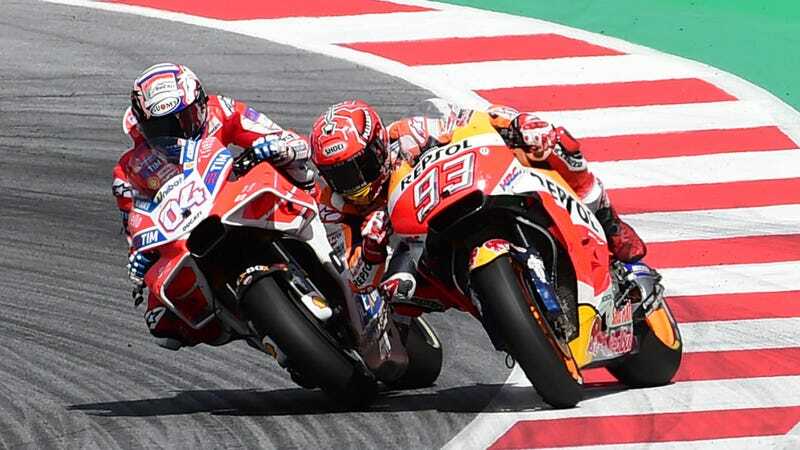 But to paraphrase English soccer great Gary Lineker’s famous quote about the German national team: MotoGP is a simple championship; 24 riders battle it out on 19 tracks and at the end, Marc Márquez wins. 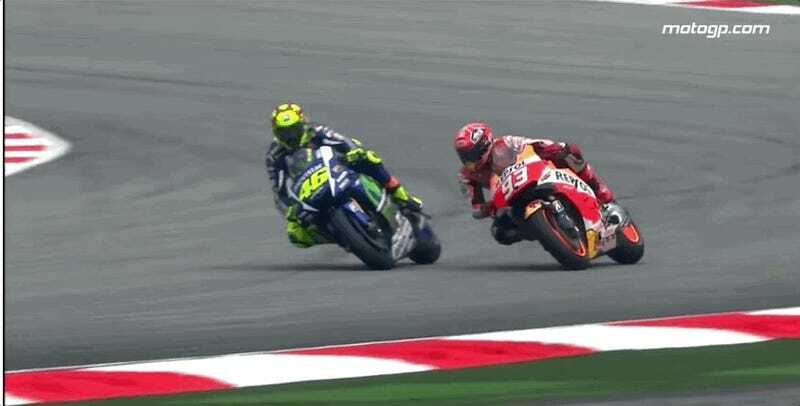 Bad blood between Marquez and Rossi culminated in this incident in Malaysia in 2015. The Spaniard burst on the scene with Repsol Honda in 2013 by winning the championship in his rookie season, and following it up by taking a stunning 13 of 18 races in 2014. After countryman Jorge Lorenzo grabbed the 2015 championship (in a season largely remembered for Rossi and Márquez’s infamous coming together in Malaysia), Márquez roared back to claim the 2016 and 2017 crowns. So is Márquez unbeatable? It’s tough to bet against him, but his all-out riding style leads to a lot of crashes (his incredible saves notwithstanding), and he’s somewhat miraculously avoided major injury so far. If he can keep hi Honda upright, he’ll always be a force to be reckoned with. Rivals can be forgiven if they get tired of the frequency of Márquez’s celebratory wheelies. Márquez’s closest competitor last year was Ducati’s Andrea Dovizioso. While the Italian put together a string of impressive results, he and his team always seemed genuinely surprised at their strong perforce. Dovizioso was always quick to play down his title chances on the season. But not this year. “This is the first year we’re a title contender from the beginning,” the Italian said in the weeks before the season. Dovizioso’s teammate is Jorge Lorenzo, a two-time champion who struggled coming to grips with the Ducati last year after his seasons with Yamaha. Lorenzo is by far the better paid of the two Ducati riders, and isn’t known to be the easiest teammate (though some of that reputation comes from his days riding alongside Rossi, and master manipulator in his own right). When Dovizioso was trying to make a late-season charge against Márquez, Lorenzo either overlooked or ignored team orders to let Dovizioso pass. Both claimed later it wasn’t a big deal and didn’t affect the outcome of the championship, but it’s hard to imagine anyone at the Bologna factory was very happy about it all. Both riders are up for new contracts in 2019, so it will be interesting to see how the two cope with the pressure if they’re both competitive. Rossi and teammate Maverick Viñales are hoping that Yamaha has worked out the problems that plagued the bike last year, when the factory riders struggled for consistency. Preseason testing didn’t give a ton of reason for hope, but there’s always the chance Yamaha will find more pace when the season starts. Last year’s top rookie, Johann Zarco, showed blazing speed on the satellite Tech3 Yamaha, which announced before the season that it is leaving its longtime partnership with the Japanese motorcycle company after this season. 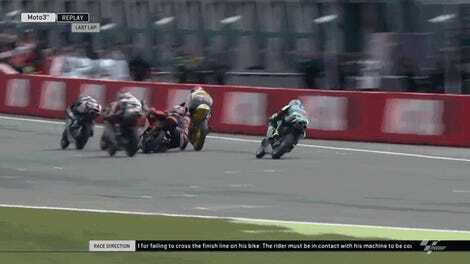 Zarco’s new teammate is Hafizh Syahrin, the first Malaysian MotoGP rider. Ecstar Suzuki took a step backward last season after losing Viñales to Yamaha. Former Ducati rider Andrea Iannone struggled and rookie Alex Rins was hurt early in the season. This Sunday’s night race in Qatar means it will be on at an unusually reasonable U.S. time of noon eastern. The easiest way to watch is if you get BeIN TV (which also carries World Superbike and MotoAmerica) through your cable provider. If you’re not so lucky, the MotoGP VideoPass is $172 for the season (or about $13 per race), which includes the Moto2 and Moto3 series as well and a handy “No Spoilers” option if you happen to be catching up on the action at a civilized hour. Now that you’re up to speed on the characters and stakes, this MotoGP season should be a lot easier to get into! If you’re already a fan, you already know we’re in for excitement.